It's a dreary day outside. Forgivingly warm, but still cloudy and taunting with the threat of storms to start Monday morning. I'm hanging out with Er, watching football, and prepping myself for the work-week ahead. I get some solace in spending a few hours getting ready for the wave of emails so I'm not surprised first thing in the morning - no one likes those kind of surprises. I took a quick break between the Eagles (boo) and the Giants (heck. yes.) just now to catch up on my blog-reading, and hey, it turns out I've hit a milestone I knew was coming but didn't think it would happen so soon. Especially since I update this thing maybe four times a year, I don't sponsor or advertise, and really only keep it alive to prevent my creative-writing skills (or what I have left of them; I may have peaked in AP English class when I was seventeen) from wilting away completely like the crimson leaves blowing around outside. I've officially hit 20,000 blog visits since its launch! Guaranteed, 10,000 were probably my own visits, making sure the graphics look tolerable and my writing doesn't sound like I use the same fifty words over and over. So - that means at least 10,000 unique visits, right? That's gotta be something to celebrate. I know many blogs get 10,000 views a week, but for me, this is a pretty big deal. So please pity cheer with me! So thank you, readers: friends, family, fellow bloggers, Instagrammers and Twitterers, strangers in Austrailia, China, and France that seem to keep finding this blog, internet stalkers, thanks to each and every one of you. 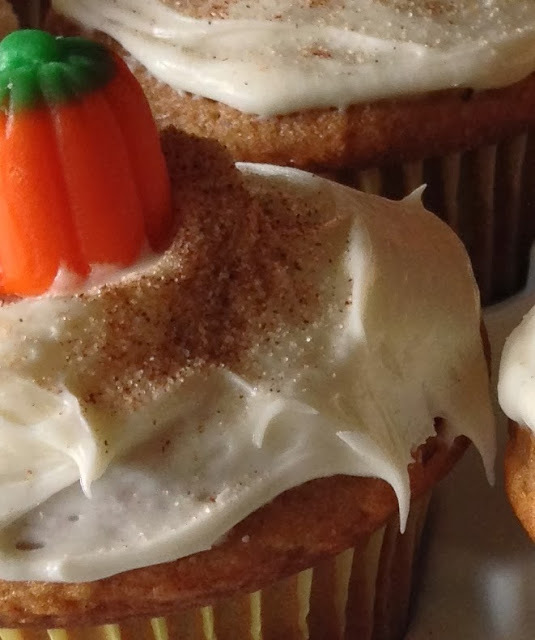 To celebrate, here's the long-coveted Vanilla Apple Pumpkin Spice cupcake recipe that a lot of you have been lusting after online. They're really semi-homemade; I start with a BOXED (I'll pause for the choral ::gasp::) spice cake base and add some flair to it. I'm sure if you make a slammin' spice cake really from scratch already, you A - are most certainly a better baker than I, B - I'm insanely envious of you, and C - you can absolutely use that instead. I'm just not sure of the conversion. But, if you are baking everything from scratch already, I'm sure you're eons ahead of me skill-wise and can figure it out. Definitely let me know if that's the case, I'll edit this appropriately! Posting these just in time for Thanksgiving. Hey family - yes, I will be bringing these with me. Don't worry. Preheat oven to 350°F for metal or glass pans, 325°F for dark or coated pans. Combine all ingredients listed above (obviously not the topping part). Mix with an electric mixer for 2 minutes. Let batter sit in the bowl for 2 minutes to rest and set. Bake in greased muffin tins for 15 minutes. You do NOT want to overbake these, so watch closely. Of course, be sure to test with a toothpick for done-ness. Let cool and remove from tins. If you have an injector, use them to poke a hole in the top of each muffin and squirt a little cream cheese frosting. It really adds a LOT, trust. 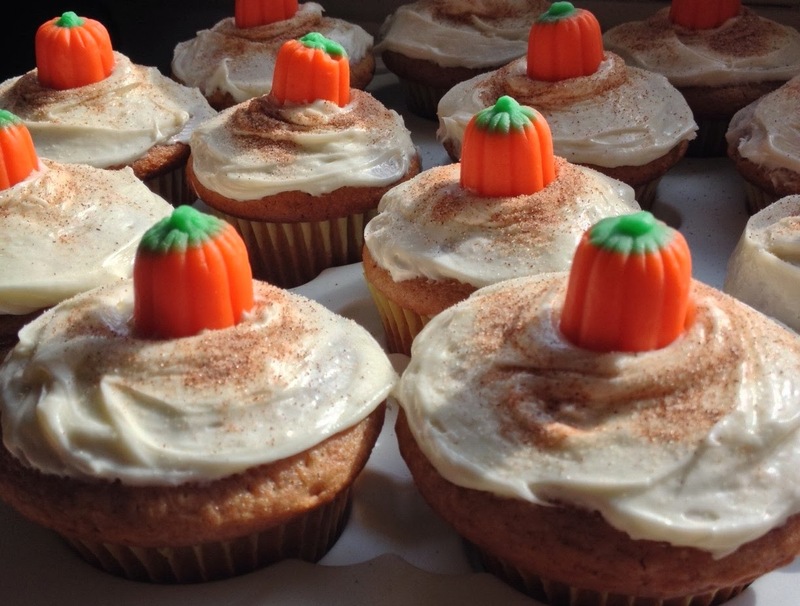 Then frost completely, dust with cinnamon sugar, and top with a candy. Note: If you don't have pumpkin spice - it's OK. It's totally overpriced and makes no sense because I guarantee you have these ingredients in your pantry already. Unless you're my boyfriend and have nothing in your kitchen yet. But that's ok because it's beautifully custom built by his and his father's hands and I am SO PROUD OF HIM. Okay enough gushing, but I will be posting about it soon. Get ready because I AM SO EXCITED to share it with you! Oh, and thanks for not commenting on my chipped nail polish. I just got a new manicure yesterday. It looks much nicer now. Let me know what you think. Hope you have a great Thanksgiving! This is the best cupcake mixture I've come across. I'm going to try this ASAP. Those look amazing! I have been meaning to check out your blog since the happy hour with Erin and Taylor! Your photos are beautiful and I want to make everything right away!